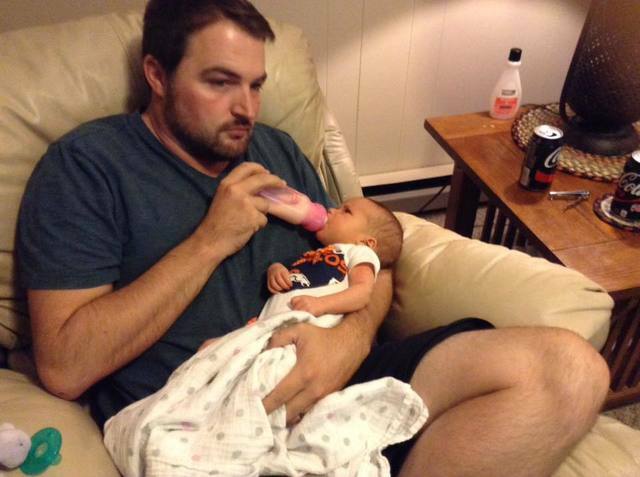 Eric Lupher: The journey so far being a first-time dad. Here's my advice for dads-to-be. It doesn't take long to realize that a full night's rest just isn't going to happen when you become a new parent. At the hospital we were told Aria would have her first ‘witching hour’ where she breastfeeds almost non-stop through the night. We were ready for it. It happened. We thought we got through it like champs. Well...four months later and Aria is still up every three hours at night. She loves to sleep during the day though. How convenient. Know that you will learn to get used to not sleeping. Your family will always make sure that you remember this and make fun of you for it. “How does it feel being a zombie all day?,” my sister-in-law (and mom of two) asked me recently. “I love watching you suffer,” my brother said to me once also. I had it easy for the first few months. Tiffany was exclusively breastfeeding before she went back to work so she was nice enough to let me sleep most nights. Then we introduced the bottle — that was the end of sleep for me. For the past several weeks I make sure to get up in the middle of the night and take a feeding shift. I try really hard NOT to interact with Aria in the middle of the night so she knows it’s not play time after I feed her. That’s really hard sometimes when she stares up at me and gives me a big smile. Zombie life is real, dads-to-be. Prepare for it. This is downright scary. Thirty percent of all infants who are shaken die and upwards of 80 percent who survive suffer permanent and life-long brain abnormalities, according to the National Center on Shaken Baby Syndrome. The number one reason a child is shaken is because the parent is frustrated with their crying baby. What’s even more frightening is that most parents who shake their baby have no previous history of violence. That’s what I have done several times. I’m not proud of this but I threw wet wipes against the wall once and I’ve screamed into a pillow a couple times only to get the giggles afterward. Bottom line is, you could be the most kind and loving dad and still get frustrated. Never take it out on your bundle of joy. I also recommend dads-to-be sign up for a daddy boot camp. It’s worth your time. Make sure to sign up for one where real babies are involved. Oh boy. This one is nasty. For the first few months Aria’s wet and dirty diapers weren't too big of a deal. A newborn’s doo doo isn’t like an adult’s. I thought to myself, “this is no big deal”. Then Aria dropped a bomb a few months in. Wow. Lets just put it this way, the diaper was no match for this beauty-in-the-pants. Aria’s pajamas were ruined, too (my favorite pajamas at that). I gagged my way through the diaper change and waved bye to the over-priced pajamas that Aria wore only once. By the way, the blowouts just get worse and worse. Prepare yourselves, dads-to-be. This one is heartbreaking. We first noticed something wasn't right when Aria stopped wanting to feed. We realized it was because she couldn't breathe because her nose was so stuffy. We used some baby mist to spray up her nose. She hated that, of course. Then we had to use a little suction thingy to clear out her nostrils. She hated that too. Then the fever came. We took Aria to the doctor. Fortunately, she had a low-grade fever and there was really nothing we could do but let the virus take its course. That meant sleepless night and lots of crying. I mean LOTS of crying. Our poor baby was so sick and we couldn't do anything about it. 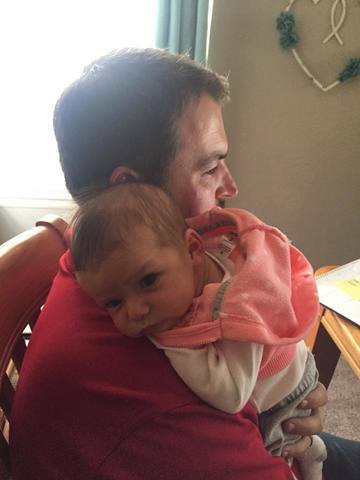 Trust me dads-to-be, a sick baby is pretty darn rough. I’ve only been through it once and I know it will happen plenty more. This is when support is key. My wife Tiffany started dreading going back to work about a month before she had to go back to work. She started stressing herself out about having enough breast milk stored. She was stressing out about me being with Aria alone. She loves me and trusts me, but not having full control was really causing her anxiety. Tiffany is a nurse so she only works three days a week. She works on my days off so I’m on daddy-duty those days. Here’s my advice for all dads-to-be: Always stay positive with your wife and reassure her that you will have everything under control. Don’t make fun of her when she writes out a napping and feeding schedule on the refrigerator. If you just follow her instructions you will be much better off. Aria decided she didn't want to take a bottle the first morning Tiffany went back to work. That was one of the moments where I went upstairs and screamed into my pillow. I learned a valuable lesson on this day. I swear Aria sensed my mood. Sure this was new to her, not having mom around in the morning, but I think she could tell I was nervous. Be aware of your wife’s emotions during this time. Tiffany had her ups and downs going back to work. A few weeks in and it all got better. Becoming a parent is not a possibility for everyone. So many have tried and it’s just not in the cards for them. My wife and I went through our own struggles to get pregnant but in the end we got such a gift. Cherish every moment. I know I will. I’ll check back in with you all here in a few months. Good luck dads-to-be!